Snippets Paint Your Heart Out, Clearwater Seeks Homes to Paint, Volunteers to Paint Homes and Donations Paint Your Heart Out, Clearwater is seeking homes to paint, volunteer painters and donations for this year’s initiative to paint the homes of disadvantaged homeowners and the elderly in Clearwater. Low- to moderate-income homeowners can apply to determine if they qualify. The organization is seeking individual volunteers, team volunteers, monetary support and sponsors to assist in this year’s event set for March 24. For more information, email Paint Your Heart Out, Clearwater at PYHOCpaintmyhouse@gmail.com or call 562-4664. Keep Clearwater Bright & Beautiful We all want to have – and to be – good neighbors. Residents should try to keep their properties neat and clean. Cleaning a driveway, a yard, patio or street gutters of dead leaves can make an enormous impact on how a neighborhood looks to others. When manicuring your lawn, be sure to properly dispose of grass clippings, leaves and other vegetative debris. Because water runs off of yards, it is important to reduce the amount of pollutants on properties. Trash, debris and pollutants in yards – such as fertilizers, pesticides and herbicides – can wash into the stormwater system, polluting the environment and causing blockages in storm pipes. To learn more, call the Engineering Department at 562-4750 or visit myclearwater.com/stormwater. 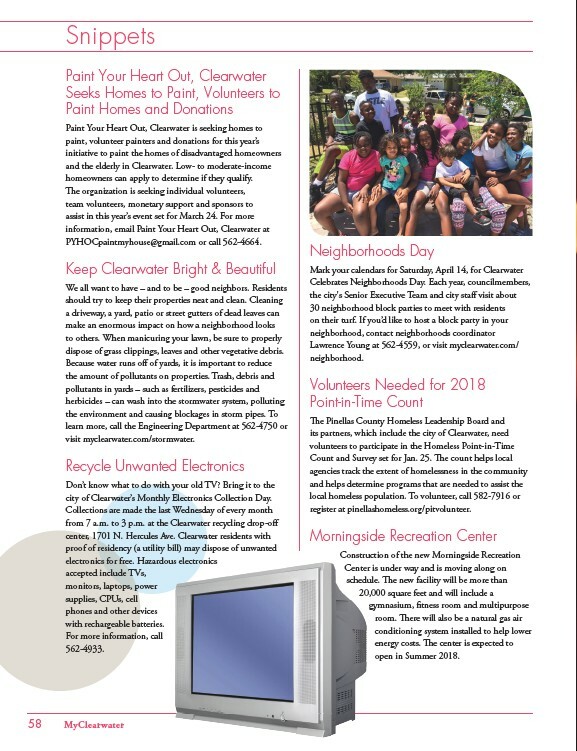 Recycle Unwanted Electronics Don’t know what to do with your old TV? Bring it to the city of Clearwater’s Monthly Electronics Collection Day. Collections are made the last Wednesday of every month from 7 a.m. to 3 p.m. at the Clearwater recycling drop-off center, 1701 N. Hercules Ave. Clearwater residents with proof of residency (a utility bill) may dispose of unwanted electronics for free. Hazardous electronics accepted include TVs, monitors, laptops, power supplies, CPUs, cell phones and other devices with rechargeable batteries. For more information, call 562-4933. 58 MyClearwater Neighborhoods Day Mark your calendars for Saturday, April 14, for Clearwater Celebrates Neighborhoods Day. Each year, councilmembers, the city's Senior Executive Team and city staff visit about 30 neighborhood block parties to meet with residents on their turf. If you’d like to host a block party in your neighborhood, contact neighborhoods coordinator Lawrence Young at 562-4559, or visit myclearwater.com/ neighborhood. Volunteers Needed for 2018 Point-in-Time Count The Pinellas County Homeless Leadership Board and its partners, which include the city of Clearwater, need volunteers to participate in the Homeless Point-in-Time Count and Survey set for Jan. 25. The count helps local agencies track the extent of homelessness in the community and helps determine programs that are needed to assist the local homeless population. To volunteer, call 582-7916 or register at pinellashomeless.org/pitvolunteer. Morningside Recreation Center Construction of the new Morningside Recreation Center is under way and is moving along on schedule. The new facility will be more than 20,000 square feet and will include a gymnasium, fitness room and multipurpose room. There will also be a natural gas air conditioning system installed to help lower energy costs. The center is expected to open in Summer 2018.